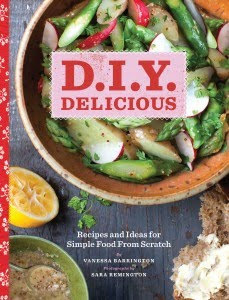 While a lot of people talk about getting back to basics, few go the whole way home, which is just what chef and author Vanessa Barrington does in D.I.Y. Delicious: Recipes and Ideas for Simple Food From Scratch (Chronicle Bo oks). There are no half measures here and certainly no “take a can of this and three of that.” From the very beginning, Chef Vanessa has us making ketchup, red wine vinegar and later yogurt, various dressings and spreads, bread, kimchi and granola. Beyond basics, there are some astonishingly good recipes included here, as well. For example, Sustainable Seafood Stew with Meyer Lemon and Parsley Aioli Croutons is amazing and hearty and surprisingly elegant for a dish this rough. Ditto Barrington’s Artichoke Soup with Crème Fraiche, which is a beautiful use of a vegetable of which we don’t see enough. While D.I.Y. Delicious is not, strictly speaking, a vegetarian cookbook, there is more here that is vegetarian than that which is not. Barrington’s whole approach is very Slow Food: simple, beautiful ingredients, respectfully treated, easily shared and enjoyed. D.I.Y. Delicious is all of those things. And more. Thanks for this sweet review. I really love it. Sharing via Facebook and Twitter now. Glad to know about this site.